Does anyone have any further information about Swiss Swords? The ones that are basically larger versions of the Swiss (Holbein) Dagger? Does the blade of the sword above fit into Oakeshott's typology, if so what type blade? Are these types of swords fairly rare or were they quite common? Anyone have any pics of other examples? The blade type does not fit into the Oakeshott typology. In their time of use, they were pretty common. Surviving today, less so perhaps. You do see them in swiss collections however. It is a common thing to see depicted in the swiss chronicles. In Landesmuseum in Zürich, there are several examples. I would not say the blades fit neatly in the Oakeshott typology, although you can see similarities: they are twists on the same basic design concepts. You see long & slim double edged blades, almost looking like type XIX blades, there are shorter ones that are petty broad (like the example you showed at the top of the thread) and there are even very broad and single edged examples. For those shorter broader ones, it seems blade length was about 55-60 cm. Longer & slimmer examples run up to 70 cm in blade length. The single edged examples have an outline like a type XVIII, but a thin triangular section. A false edge running a third of the length from the point is not unusual. Width at base can be 55-60 mm. There can be a grove or shallow fuller along the back. They have the same hilt as other Degen, only the pommel is often slightly asymmetrical. Look at some big single edged Baselards for comparison. The pommel part is almost like a spur, or perhaps you can see the pommel as slightly bird shaped: one side protrudes more than the other. Sometimes the guard is a fairly substantial bar of iron, sometimes the wooden hilt only has a thin iron sheet metal reinforcement toward the blade. I have got the impression that the guard is often fitted so that it slips over the blade from the point and is fastened with two small lugs that go through the wood and is peened down. If you look for this feature, note that the cut our for the wood in the guard is often as wide or wider than the blade width. That is a clue for this type of slip on construction. 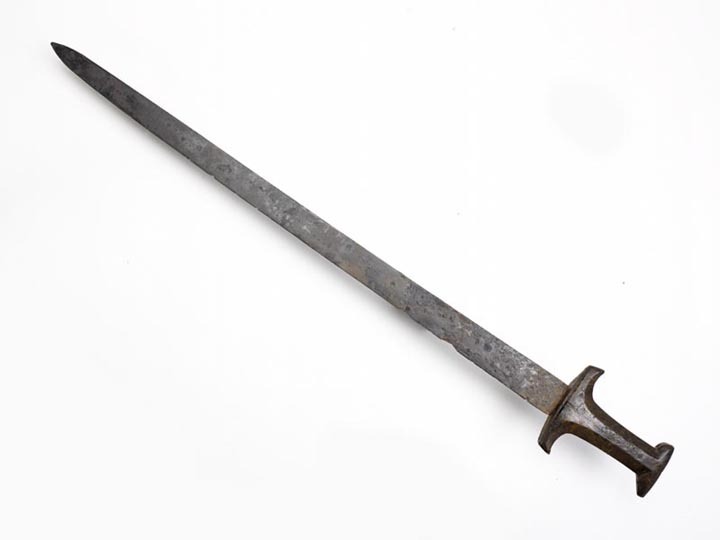 A kind of remnant from a knife type construction, rather than a development of the cross guard of a sword. 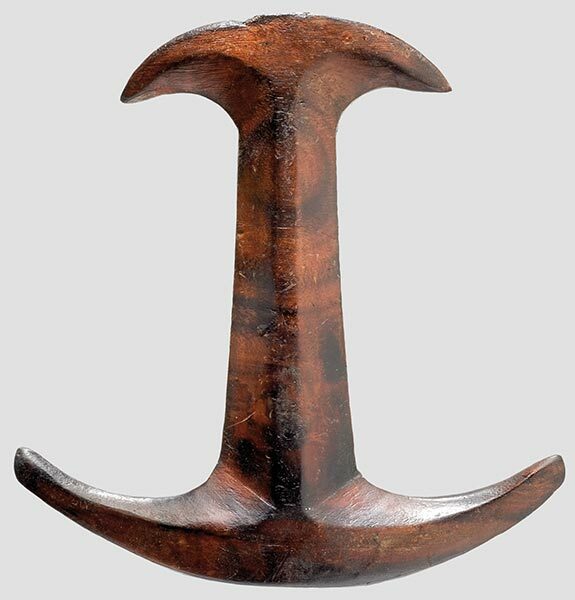 The pommel is often a thick band of iron bent into a crescent or C-shape. It is also rather common to have a thin sheet of brass or bronze between the iron parts and the wood. This is has a very decorative effect. Blade type ad cross section vary along some themes. There are diamond shaped ones, that tend to be more pointy. They look like small and narrow type XVIII blades. Hollow ground bevels are common. You also have those that look almost like small type XIX blades. The typical decorative groves of the ricasso on XIX blades are absent, but instead you can see set ups of shallow groves or fullers. These blades are not so pointy, but have a small spade shaped point. The shorter, broader ones are more varied in their shape. Lenticular sections as well as more complex ones can be seen. These short swiss swords seem to fulfill the same function as the later Katzbanlger: a handy weapon for close quarter fighting. Somehow I see them belonging to the tradition of the ancient European fighting knife (and the utilitarian short sword from seen in various forms in different time periods). The name for these is Swiss Degen. Degen is a word that means dagger, but came to mean slim cut and thrust sword in later periods. Thank you for clarifying this. I always wondered why degen is often used to describe some types of swords. It always confused me. Can we document that these were called 'degen' in the 15th century? We have one fighting text from that period (Cgm 558) that refers to the 'baselard', so I'm wondering. We also have copious sources for fighting with degen/tegen, but these are unambiguously dagger treatises, not techniques for a short sword. Of course, all of this could simply be a part of the confusing panoply of medieval terminology. After all, it's pretty inconvenient that the short falchion in Germany is a 'messer'. You put me in a spot with that actually. I shall see if I can check this up to make sure., wether the name degen was used in the 15th C.
I had always thought so, but such convictions should naturally always be validated! I have a few texts that might shed some light on this. I will return when I know more. The Swedish king Erik XIV (son of Gustav Wasa) makes note in a letter written 1563, that the solders did not know "huru de schole schicke medh hellebårder, spetzer, swärd och dägene när vmtrenger emoth fijenderne" ...or: how to hold themselves well with halberds, points, swords or *dägene* (= degen) when advancing against the enemy (my translation). Heribert Seitz concludes that the cut and thrust sword (in Swedish: "värja", but in German "degen") was in use even among foot soldiers at this time, while before the typical sword among infantry would have been the shorter Katzbalger. At this time the word Dägen/ Degen would denote a longer blade suited for both cut and thrust. "Degen" originally derived from medieval latin "daga", "dagger", "daggerius" and others, also found in Italian and Spanish "daga", french "dague" and Swedish and Danish "daggert", are all synonyms for short sword (or long dagger). The etymology derives from the defining of a lighter and initially shorter weapon from the more powerful sword. The concept of "degen" can at the earliest be traced to east germanic areas around 1400. So from this I leapt to the conclusion that the Swiss short sword was known as Degen already at the time of its use. I may be wrong, but I do not think it is a wild guess. Some light shed on the matter? ... We have one fighting text from that period (Cgm 558) that refers to the 'baselard', so I'm wondering. Christian, I think it is to the point that the Baselard is called a degen in historical texts (I hope I understood you correctly in this?) The Baselard is closely related to the Swss short sword, both in construction, function and general size. Just like the swiss dagger can be found as medium or large dagger as well as a short sword, so can the baselard be seen both a shorter dagger sized weapon as well as a longer blade qualifying as a short sword. The longer versions of the Baselard tends to be rather stout single edged blades. These are not very different from the Swiss short sword or degen. Here's the confusing thing...Cgm 558 is a Swiss text. In it are techniques for the messer, degen, baselard, longsword, etc. The degen in this case is a dagger, not a short sword. And this is why I'm wondering about all this - given the Swiss origin of this text, it seems that 'degen' is used for dagger, and 'baselard' for a short sword, both in a 15th c. source. But let me re-read these passages to be sure my assumptions of what type of weapon associated with what techniques are correct. It will be interesting to see what you find. I think this is one of these cases where a weapon is known by many names. By the mid 16th C a Degen is a pointy cut and thrust sword, somehow distinct from the sword. But, it is clear that the same type of sword could be name differently: in one catalogue they are named "Dägen", "Deighen", "Stickeswerd", "spitsig" värja, "Stodeighen" and "Rappir". All this is beside the point concerning the Swiss Degen (?). I will also keep looking. I have a strong feeling I´ve seen this stated that this weapon was known as a degen by the 15th C.
Arma Bohemia & Manfred Pany make replicas of the Degen. Regarding the picture you posted, I recognise the 2nd from the left as the Wallace Collection Baselard. The first from the left is the Baselard from the London Museum? The first one on the left is from Museum of London (this one is single edged and has a back edge a fifth of the length from the point). The long graceful one in the middle is from Provinciaal Overijssels Museum, Zwolle. Second from right is from the Met. I do not know where the short baselard on extreme right is from. Most men wore daggers at their belts, partly for protection in the streets but also because it was fashionable. Large daggers like this, with blades as big as those of swords, were known as 'baselards': the fashion came from Basel, in Switzerland. Baselards seem to have been popular with wealthy London merchants. During the Peasants' Revolt in June 1381, the rebels met King Richard II at Smithfield. In the confusion, the mayor, William Walworth, pulled out a baselard and struck the rebel leader, Wat Tyler; then one of the king's followers killed Tyler with a sword blow.